There are many things that shape a nation’s culinary characteristics; the geographic location, culture, history, economy, and social environment. The geography, then, would tell what the nature can supply abundantly for the country. People’s preferences of how they like their food and beverages cooked and served are influenced by culture and history. This is why a culinary journey is always interesting and inviting. People always love to try something that is different from what they usually have and see if their taste buds can welcome the more exotic cuisines. Russian cuisine is influenced by Orthodox belief and this makes the country put bread as one of their staple foods. Vegan culture is also quite common in Russia. As for the desserts, the nation loves them sweet. One of the most popular after meal dishes is ice cream and Russian is among the countries with the most delicious frozen dessert. Back to the Soviet era, when the strict standards were still applied to all sorts of production within its domain, ice cream should be made only with natural ingredients with no preservatives or additives. The fat and sugar contents were high so the authentic Russian ice cream was known for being rich and very soft. Surely the recipe has changed a lot over the year, but the original taste is still carefully preserved. One factory that restores the Soviet ice cream recipes is Petroholod in Saint Petersburg. After the Soviet Union took its fall, the strict standards haven’t been really applied in the Russian ice cream productions and the fact consequently gives room for innovation of new flavors to happen. From the once plain plombir – the basic Soviet ice cream – to plombir with many tastes and toppings. In this article, we are going to talk about 9 popular dressings for Russian ice cream. See if you like some better than the other. Like we have mentioned before, Russians love their desserts sweet. So, it was not a problem for them to top their already sweet ice cream with something just as sweet. The honey would go with just about any ice cream flavors, but vanilla blends with it the most. Home-made fruit jams are so good for vanilla and any fruit-flavored ice cream. It will be even more heavenly when chopped fruits are also added. So fresh for the summer days. Crushed nuts topping is the most flexible one; it goes with every flavor. Ice cream dressings used to be essential during the Soviet Union era because the dessert’s flavors were still limited and plain. So, to make it more flavorful and festive, dressings were added. Today, Russian ice creams are produced in so many selections. Starting from the classic vanilla and chocolate to the quirkiest ones like sea buckthorn and rosemary. Dressings, then, have turned into more of like companions rather than a game changer. When people buy the packed ice creams from the convenience stores, shops, or supermarkets, they would just enjoy them right out of the packaging. But when they order the scooped tray versions that are usually sold in restaurants and cafes, dressings and garnishes become a must. The vintage serving way of scooped ice cream used these bowls made of metal. Some places still use these vintage bowls, but the others use high glasses and ceramic bowls. People get to choose what they would like to top or dress their scooped ice cream with in these places, usually for the classic flavors. For the fruity ones, they are served with sliced fruits and honey. The banana and cinnamon would come with halved banana and nuts. The gingerbread with biscuits, simple syrup or honey, and chopped peanuts. Fruit jams are the dressings that live close to Russians’ hearts because they are most of the time home-made and have been used for decades. The old way of serving them with ice cream was by swirling the jams on top of the ice cream. Today, the jams don’t only appear as dressings but also mixed as swirl or marble. Russia grows very good berries and this is why their fruit jams are the best. The tropical fruits the ice cream factories in Russia have infused as flavors are coconut and mango. Peanuts and fruits that the Russians use for dressings and toppings are usually glazed in honey or soaked beforehand in vodka. This adds to the flavor definitely, but may not be suitable for everyone. So, have you picked which one out of the 9 popular dressings for Russian ice cream that you like? All sound so delicious, right? But actually you can make these dressings and toppings at home because the ingredients to make them are commonly available around the world. As for the ice cream, well you have to come and visit Russia to get the authentic taste. 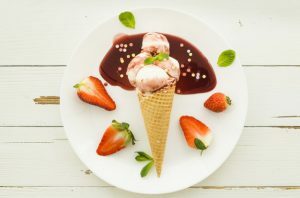 If you only want to try the dressings out for your local ice cream, then write down the list and go ahead make your way to the nearest supermarket to get them. They are surely good for all kinds of ice cream, not just the Russian.